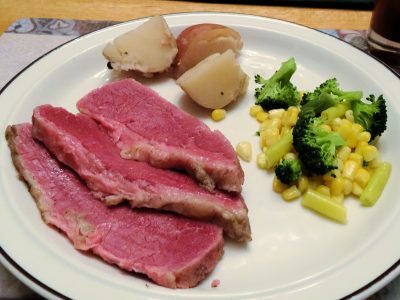 When I was growing up, corned beef was bought in a package in the meat section and was boiled in water for 3 hours. It was good but it could be so much better. Here is how I make it. I started off with a brisket flat. In my Carne Asada Burnt End Tacos post I had used the point. 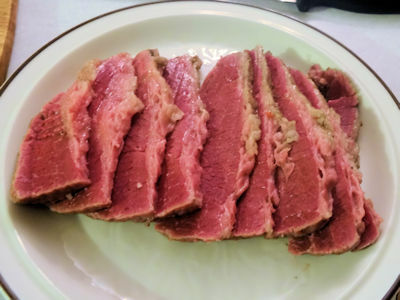 You can make corned beef out of the point section of a brisket but it will be fattier. Trim the thickest layers of surface fat down to 1/4 inch. I also had to cut it in two to fit it in my curing container. Put the meat in a nonreactive container (stainless steel, glass, ceramic, food grade plastic) and covered it with water. Weigh the total of the water and the meat. If you have a scale with a tare function, put the container on the scale and zero it. Add the beef and water. If you don’t have a scale with a tare function, weigh the container. Add the beef and cover with water. Weigh the container full of water and subtract the container weight. Bring the water to a boil and reduce to a simmer and let simmer for 10 minutes. For each Kilogram of beef and water add 3 grams of Prague powder #1. This is a curing salt and may also be called Instacure #1, pink salt, or a myriad other names. As long as it is a mixture of 6.25% sodium nitrite and 93.75% salt it is fine. It is important you don’t use too much as it can make you ill and too little won’t cure the beef which protects it from bacterial growth and gives the pink colour to the beef. If you are going by pounds, add 0.048 ounces of Prague powder #1 per pound of beef and water. Using an injection syringe, inject some of the liquid every inch or so into the meat. This is messy and it may squirt out in places. Put the meat in the container of liquid and put a plate on top to keep it submerged. Put the container in a refrigerator for 7 days, turning the meat occasionally. Take the meat out of the brine and rinse it under the tap. Pat it dry with paper towels. I cut the meat into serving size pieces. As there is only She Who Must Be Obeyed and the flat was particularly large, I cut ours into 4 pieces of about 1 kilogram (2 pounds) each. I sealed 3 of them with my Foodsaver and froze them. A word of warning about freezing corned beef. It only lasts for about 2 months in the freezer and then the texture suffers. I cut up four potatoes into quarters and put them in the bottom of my crockpot. I cut a few chunks of onion over the potatoes. I put the piece of meat I didn’t freeze in the crockpot and covered it with water. I poured that over the top of the liquid, added a small bay leaf, and put the lid on and cooked in the crockpot for 9 hours on the low setting. I took the corned beef out and scooped the potatoes and onions out with a slotted spoon. My dad used to like some of the liquid on his meat. I find it a little strong but if you want to try it, pull some of the liquid from under the fat floating on top with a poultry baster. Serve the corned beef with the potatoes and your favourite vegetables. You’ll note that I do not serve cabbage with my corned beef. I don’t like cooked cabbage. Case closed. If you like cabbage with your corned beef, chop 375 ml (1 1/2 cup) of cabbage and put it on top of the beef for the last hour of cooking. 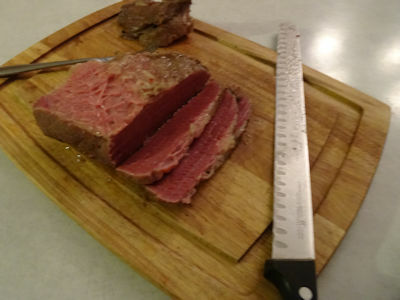 This is a great corned beef. It has way more flavour than the commercial product. There is a rich spicy, herb flavour that really complements the cured beef. The sandwiches the next day are even better! Trim any thick surface fat on the brisket to 1/4 inch. Put the beef in a nonreactive container and cover with water. Weigh the beef and water. Remove the beef from the water. Add the appropriate amount of kosher salt, sugar, garlic and pickling spice to the water. Bring the water to a boil and reduce heat to simmer for 10 minutes. Add the appropriate amount of Prague powder #1 and mix to dissolve. 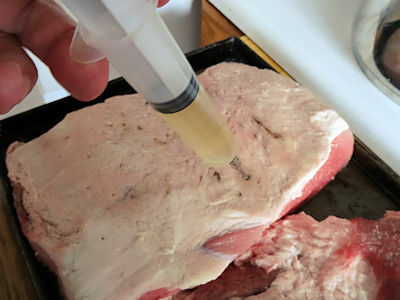 Using a syringe injector, inject some of the liquid into the brisket, every inch or so. Put the beef in the liquid and put a plate on top to keep it submerged. Put the container in the refrigerator to cure for 7 days, turning the meat occasionally. Rinse the meat well and let it drain on a rack. Freeze any corned beef you won't be using in the next few days. To cook a 1 kg piece of the corned beef, cut the potatoes into quarters place in a crockpot and sprinkle the onions over them. Put the beef on top of the potatoes. Cover the beef with water. Mix the spices together and sprinkle on the surface. Take the potatoes out of the liquid with a slotted spoon. Serve with some of the cooking liquid if desired. If you want cabbage with your corned beef. Chop it and spread it over the corned beef for the last hour of cooking. This demands to be made, thank you! Har! I hope you like it! Beautiful Corned Beef my friend. Had no idea it lost texture within 2 months in the freezer. Good info. Great recipe. Thanks, Brian. I learned about the corned beef issue when I asked a butcher why you couldn’t by a frozen corned beef. I didn’t believe him at first but did some research. He was right. Shows you should listen to the experts!